Tomorrow we leave home and head off on a three week, nearly 7000km (4300ml) road trip, which will take us into the spiritual heart of Australia. We first drive down to Melbourne, where I’m taking some photos at a friend’s wedding. After that, we’ll catch up with The Landers Express, which is always a breathless occasion! Peter & Julie Landers, of Portuguese Camino fame, have kindly invited us to stay overnight, so it will be a great chance to catch up – as long as they don’t break out the White Port. Last time we visited I brought them a 44 gallon drum (or thereabouts) of a Mudgee White Port. I wonder if there’s any left? 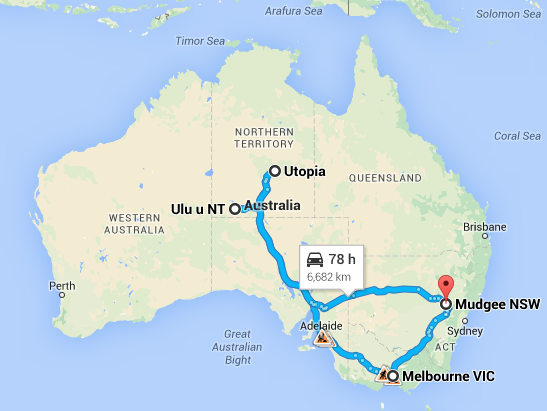 From Melbourne we then head north, up to a remote aboriginal community north of Alice Springs. It’s called Utopia. We’ve been invited to film with some aboriginal elders – some wise men. I want to get their unique perspective on intuition for the PGS film. We’re living with them for a few days, and they’ve also given us permission to film some ceremonial dances, which they don’t often do. So that should be fascinating. We then drive back to Alice Springs, overnight, then the following day make our way to Uluru – once known as Ayers Rock – an iconic Australian symbol. I’ve traveled extensively throughout Australia, and there aren’t many places I haven’t been to during my time as a documentary maker, but I’ve never been to Uluru. I’m looking forward to it. To me, it seems to be the spiritual heart of Australia. Jennifer and I are staying there for five days to attend a Consciousness Retreat, convened by a very famous US spiritual channeller named Kryon. Jennifer has been listening to Kryon podcasts for years – and he has very strong and well articulated views on intuition. We’re back about two weeks, then we’re off to Italy for the Assisi Tour, then Turkey to film with the Sufis, again for PGS. So it’s a busy time now up until mid June. I have always wanted to go there Britta – I’ve been pretty much everywhere else – the Kimberleys, the Bungle Bungles, I’ve spent time on aboriginal communities in remote parts of Arnhem land, but never Uluru. Looking forward to it, particularly photographically. I’ll be blogging each day. 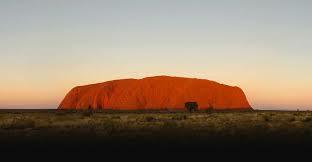 Bill, As I was scrolling down the post and saw the map, I wondered if you were going to Ayers Rock. Sure enough next paragraph, there it was – Ayers Rock. Until I started following your blog I didn’t know much about Australia. I knew you had kangaroos and it was where awesome Ayers Rock was located. You straightened me out on the third thing I knew – “shrimp on the Barby”. Ha! Really looking forward to a multitude of pictures of Ayers Rock! Just looked at the calendar. The 13th is the next cricket match between Australia and Scotland. Will you be taking wedding pictures or be at the Landers Express for the game? If at the Landers Express and there is any of that “44 gallons” of white port available when you arrive I would imagine it will be gone by the end of six hours of cricket!! Hooly Dooly!! Have a glass for Dale and I. We will be watching the score and some highlights as we have given up looking for a pub that would have it on. Hugs to you and Jen!! Bill, yet another wonderful trip to share with your Blog followers. 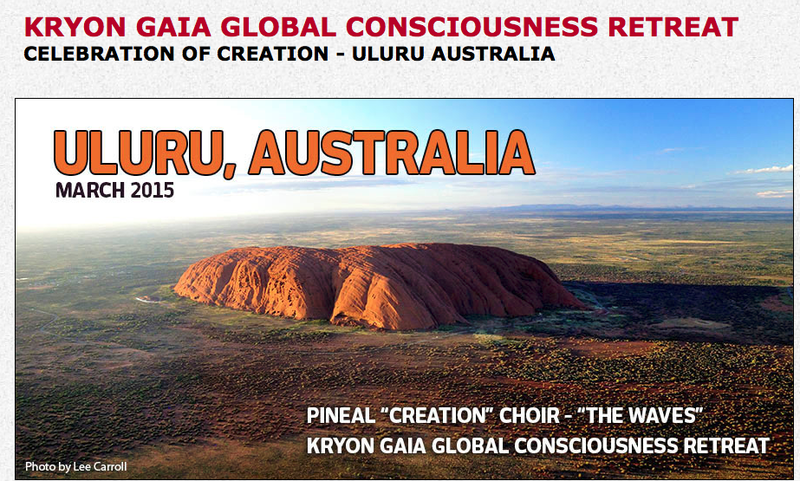 I am sure being at Uluru and the retreat will have significant impact. For me, Kata Tjuta was a much more spiritual and emotional experience – incredible connection with Mother Earth. I was privileged to spend some weeks in a remote Aboriginal community, about 10 hours west of Uluru. About to head up to the Top End and Darwin. Should be great. Blessings to you and Jennifer. I look forward to reading about your Centre experience. You must have quite a deal of personal experience up there. What were you doing in the aboriginal community? And what will you be doing up the top end this time? We might pass each other on the highway! Yes I’m looking forward to taking some shots out there. The trick will be to shoot it in a way that’s not typical. That’s not what we’ve seen before, and yet still captures the essence of the place. This is all fantastic Bill! Australia is such a big and wild place, now I know that when we visit someday that we need plenty of time. Did you see on the Accomadations site that the Dalai Lama will be at Uluru on June 13?